Delight them with diamonds! This timeless white gold set features a pair of stunning diamond stud earrings, adding a smart and sophisticated splash of sparkle to your ears. A co-ordinating diamond pendant sits upon a chic white gold fine chain. Demure yet radiant, this set is perfect for any lady to exude elegance. 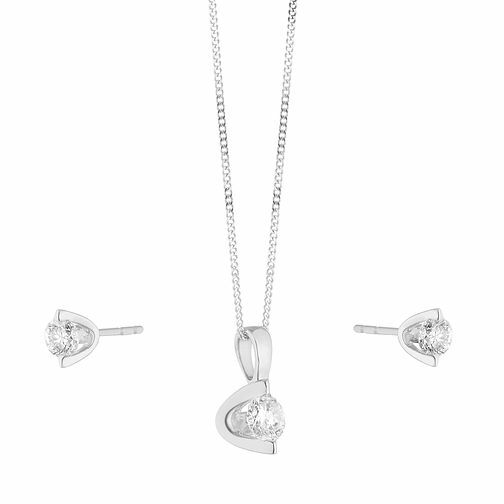 9ct White Gold 1/2ct Diamond Earring & Pendant Set is rated 4.0 out of 5 by 1. Rated 4 out of 5 by Anonymous from Very pretty It's a gift for my daughter's 40th Birthday in late January. I bought it at the Xmas/NY sale so unable to review it completely. It's a good price and a very pretty set that I'm sure she will love.